Casino Charms slot by Playtech 80 lines packed with features! 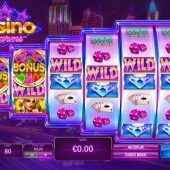 Casino Charms slot by Playtech has a retro neon appearance with a Las Vegas type nightscape in the background and is filled with all those lucky symbols associated with land based casinos. Gentle jazzy music plays while we spin and the odd appearance of the reels promises some fun in keeping with this luminous theme as do Neon Staxx, Neon City Casino and Neon Reels. Will our bankroll itself find this casino to be full of lucky charms though? If you've ever played those WMS slots like Red Flag Fleet you'll have seen already the stepped reel rows we have here on Casino Charms. There are 6 reels with rows of 3,4,5,6,7 and 7 symbols over which are 80 fixed lines. All symbols appear stacked with the exception of the bonus scatters which only appear on reels 1,2 and 3 and you cannot get a full line of Wilds as these don't appear on reel 1. The 6-of-a-kind pays are quite low due to the number of pay lines and we pay 80-coins for Roxy at 200, Diamond, Dice or Green 7 160, Chips, Cards or Bars 100 with 4 card suits at 80 each. Before we come to the bonus, there is a Charm from Roxy you could see quite regularly! If Roxy appears fully stacked on the 3-rows of reel 1, you get 2 respins with all Roxy and Wilds on the grid frozen. This doesn't guarantee a win but even a full grid would only pay 200x bet. Landing the 3 wheel scatters on the first 3 reels will trigger a wheel bonus. You are guaranteed Free Spins of some description so don't worry about silly cash values here! 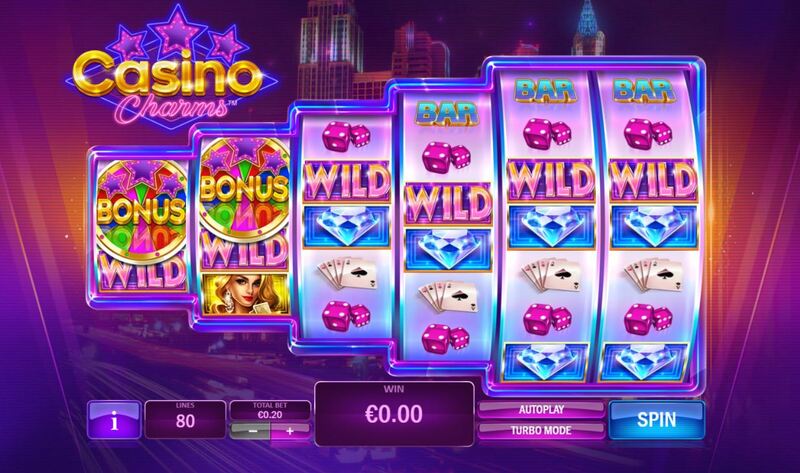 You can get 10 to 15 Free games which have reels 5 and 6 full of Wilds, 10 to 25 standard free games or Mega Respins which are like the Roxy Respins but with up to 8 respins instead of 2. You can also retrigger the two free games possibilitlies but not the Mega Respins.